My small Christmas cactus is outdoing itself this year. It doesn't pay attention to the calendar and blooms in November, not December. Large blossoms almost glow in the light from the window, especially on gray days. The larger plant seen just to the left of this one has smaller leaves and is getting ready to bloom. I've had it longer and last year it didn't do very well. I'm hoping this year will be better. What amazing plants these are - brilliant, energizing color from South America when Canadian autumns turn dull. I'm thankful for color. I am looking forward to see mine. I see tiny buds and hope to see it blossoms Thursday. Happy Monday! It is absolutely gorgeous. I have two Schlumbergeras, but they bloom during our winter here which is June through to August. I see buds on mine, too! Those are gigantic blooms on that plant!! Amazing! The book mentioned in your prior post sounds wonderful. I'm going to see if I can find it... I have two people I want to give it to! Thank you for sharing that. Just lovely, Lorrie. Your previous post was very moving. I really love Brennan Manning's writings. What gorgeous colour! I hope mine will bloom this year. There are tiny buds all over it, but I've been fooled by it before. Stunning colour, red hot chilli peppers spring to mind. Hope your week is grand. It is a lovely blooming cactus. Beautiful photos and mosaic. Have a wonderful week! I'm looking forward to having a christmas cactus this year. yours is gorgeous! what a beautiful flower - and just the right colour for Christmas! Have a wonderful week, and thankyou for stopping by my blog to say hi. Wow that is an impressive bloom on that little cactus. And such a gorgeous color. I love how flowers always look like they are made of satin. 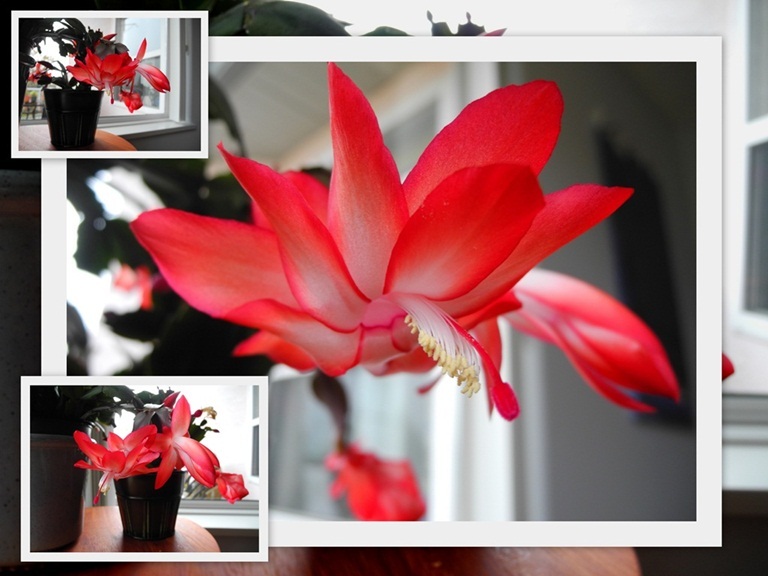 Lorrie the Christmas Cactus is such a special flowering plant; yours are gorgeous! Thank you so much for writing to wish me well. The hip replacement is taking well. I am doing my rehab like a good patient! Just wanted you to know that I did not read your post yesterday before writing my own. I smiled all day long. Now I'm going back to find out what kind of camera you settled on because the photography is outstanding. Wow...These are gorgeous photos of gorgeous blooms...I just love Christmas cactus...wish I could keep it blooming all year round though!!! Enjoy yours!!! Beautiful! And it looks quite Canadian to me...especially if there was a Canadian flag nearby. To get it to flower at Christmas you have to keep it very dry in the summer months. Wow! Absolutely gorgeous. The colours are inspiring, Lorrie. Stunning bloom! It makes a gorgeous mosaic. Had a chuckle... they bloom when they want... forget the calendar! What a beautiful color!!! WOW! WOW Lorrie! THAT IS STUNNING!! I have never seen any color other than the solid red ones. Thank you for visiting my Christmas blog, Christmas Tree Lane. I am so glad you posted that you loved Christmas Eve, too! As a youngster it was all about Midnight Mass but now I can go to an earlier service and be just as content! What a coincidence..I snapped photos of MY Christmas cactus just this past week, too. Haven't shown them yet on my blog. Mine is HOT PINK & I've had this plant for almost 15 yrs. Your photos are incredible! Great job!